Update: Ayesha Omar opens her about the first step to her healthy and active life. According to Ayesha, the journey of a healthy life starts with a clean diet. Adding on, having a clean diet, is a good habit, there are people who say things like “you are very conscious about your diet,” it is a good thing, there is nothing bad about wanting to stay healthy and choosing what you should eat to embark on the journey to health and fitness. Ayesha’s journey started 3 years ago when she decided she had to completely change her diet, which changed everything. Her skin, weight, energy level and more by simply changing her grocery list! Ayesha prefers fresh fruits, veggies, and mostly, she prefers to go shopping from Empress Market for fresh groceries! 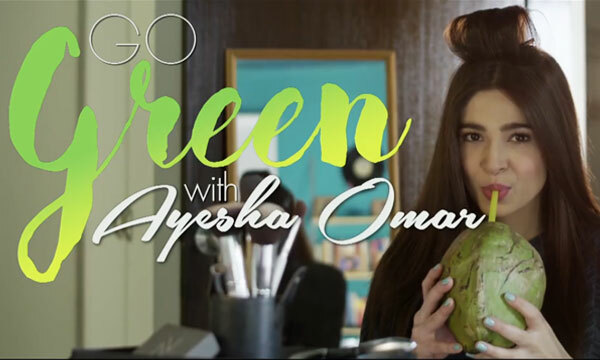 The ‘Tutti Fruity’ chirpy Ayesha Omar is pairing up with Lipton to share her fitness secrets in the new Go Green with Ayesha Omar. Lipton shared a very interesting video briefly highlighting the superstar’s fitness journey from waking up to going out and about and making sure there are no compromises in her projects. Want to take a sneak peek into the life of one of Pakistan’s most happening celebs? Take a look at the video below! Share your fitness secrets with us too in the comments below! Previous articleFaryal Makhdoom Opens Up About Latest Snapchat Controversy! Next articleDonald Trump Is Time Person Of The Year & Twitter Can’t Handle it!